Brain & Spine Centre is the collaboration of Neurosurgeons, Dr Kam and Dr McMaster. They both specialise in complex spine surgery, brain tumors, spinal tumor and trauma. They offer their services in Westmead, Bella Vista, and Wahroonga, NSW. The practice’s patients are of all ages but tend to be older, geographically they are from Sydney. 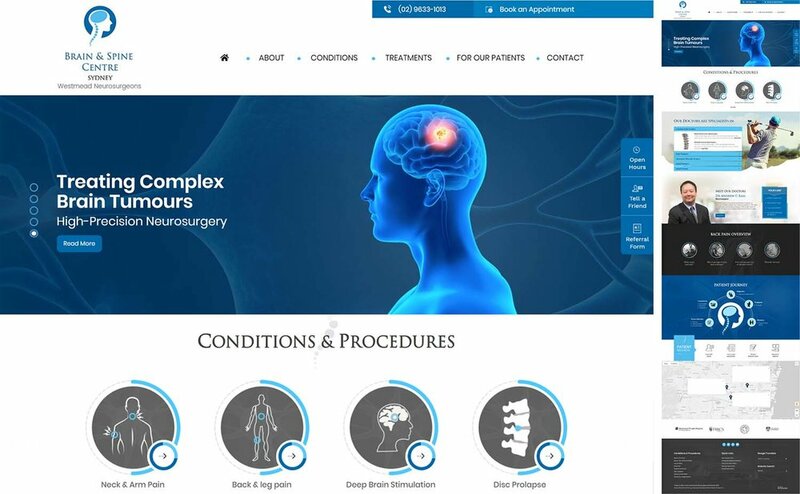 The purpose of the medical website design is to promote and be found for targeted keywords, position Drs Kam & McMaster as a credible and effective choice, and help convert visitors into patients. The medical website design needs to fully mobile responsive, uncluttered, consistent, contemporary, professional, and friendly. The healthcare website needs to stand out and help convert patients in an increasingly competitive area, be patient-focused, visually-engaging, and address patients’ needs and questions.